by Cory -- If this pillar less Mercedes coupe could talk, oh the stories it could tell. Today’s car was alleged to be owned by Michael Bivins of 1990’s new jack swing band Bell Biv DeVoe. It seems plausible given the “tri-amped” Beverly Hills audio set up left in the trunk of the car and MLB (Michael Lamont Bivins) initials on the door. 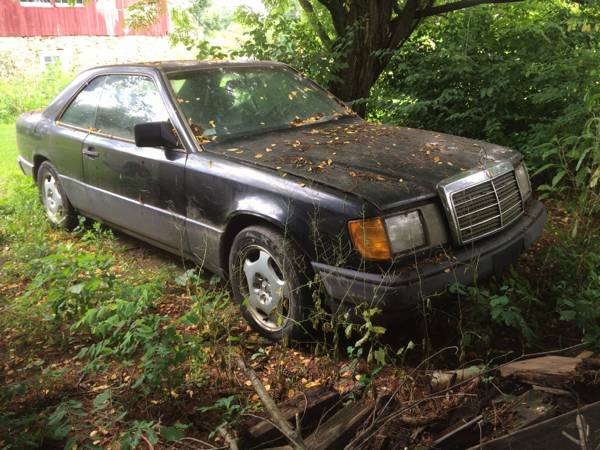 The 1989 Mercedes-Benz 300CE is for sale in Allentown, PA for $1500. 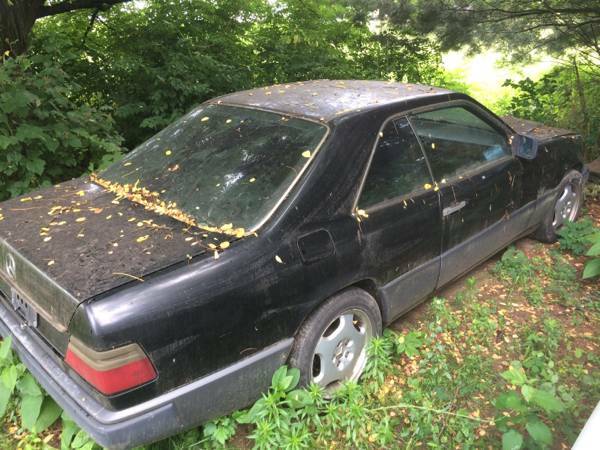 In the spirit of the barn find phenomenon, our seller has left every last bit of algae, pond scum, dirt, and weeds around the car all untouched. Pride in ownership is on clearly on display here! The car has lost reverse gear which is a very common w124 model benz problem. The lower dash panel has been removed, glove box was forced open, and now ignition is operated by a screw driver instead of a key. The seller is having a Mercedes liquidation sale with four cars for sale. He has second w124 coupe that is pictured side by side with this one and also a 1997 E320 and 1997 S320. See another car covered in poison ivy? email tips@dailyturismo.com. Cory is trying to finish off his project 1995 Mercedes E36 wagon and figure out what to do with his hoard of rare w124 parts. Ha Ha took the words out of my mouth! I would love to bring this car back to it's 1990s glory. 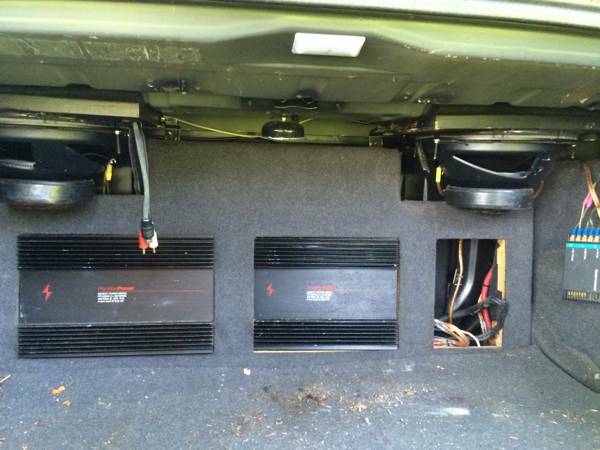 I had my Orion amps set up the same way in my Maxima. 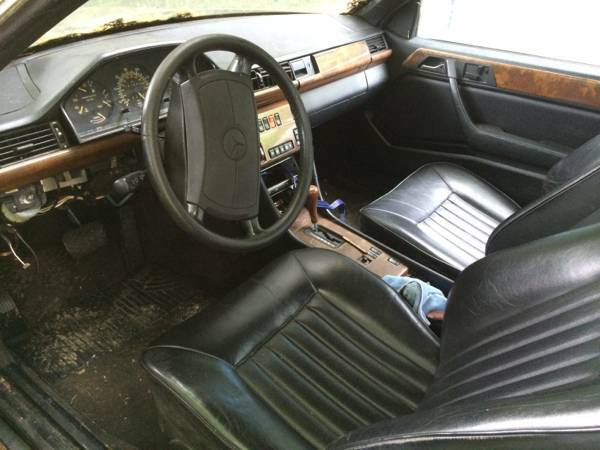 Man, those PPI amps were top of the line back in the day.......They're probably easily worth 30% of this car's asking price. What a shame!! I bought that car from Michaels's aunt in N.J. which he had given to his cousin. It was in mint condition at the time which had to be around 2005 or 2006. The only thing I changed was upgrading the wheels and a woodgrain steering wheel which looks like they were removed at some point....sad that car had has history..was in the Poison video!